Stroll along the Mississippi, through the French Market, Jackson Square and down the sidewalks of quaint streets. Let a 'local expert' unravel the mysteries of America's oldest and most unique living neighborhood! Spooky but fun - A nighttime walking tour of the French Quarter is sure to give you goose bumps! See why New Orleans has been referred to as "The most haunted city in America." Walking tour of the Crescent City's most exclusive area. View the beautiful Greek Revival homes in the "American" section of New Orleans... Homes of former Kings and Queens of Mardi Gras. The Original Five Star Garden District Tour! This famous tour explores the part of New Orleans known as the "American" section of town. The elegant, lavish and historic Garden District was built in the 1800's to rival the architectural splendor and beauty of the French Quarter. Take a walk through the French Quarter's famous bars and restaurants and discover the history of the city's celebrated cocktails. Tour includes interesting and fun stories of New Orleans famous "spirits". It's history...with a twist! 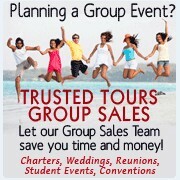 Looking for the perfect special event that everyone is sure to enjoy? Want to take in neighborhoods, sights, and culture of New Orleans? Excited to take a spin around town for a closer look of the city? Then the New Orleans Beyond the French Quarter Bike Tour is for you!